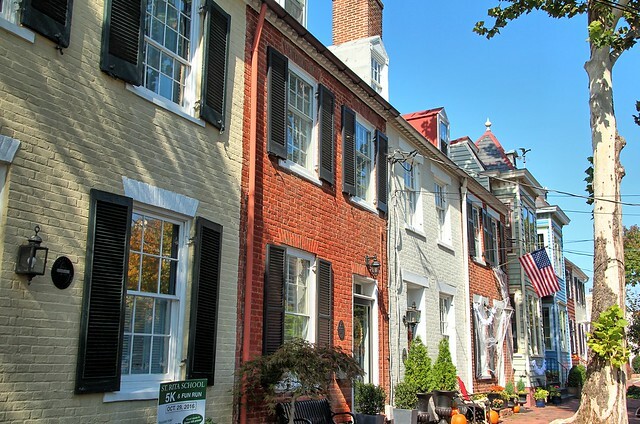 Steeped in history, full of charm, and jam packed with interesting sights and architecture, the streets of Old Town Alexandria's neighborhoods make for a day of fun while wandering, gawking, and learning. Having lived in Alexandria since 2000, and in historic Old Town since 2003, we never tire of Old Town. It's not unusual to find us going on walks several times per week just to enjoy this place we call home. Now that we're solidly into the beautiful fall weather, we want to share some of our favorite Old Town Alexandria walking paths with you. Best of all, these are all tours from the perspective of locals. 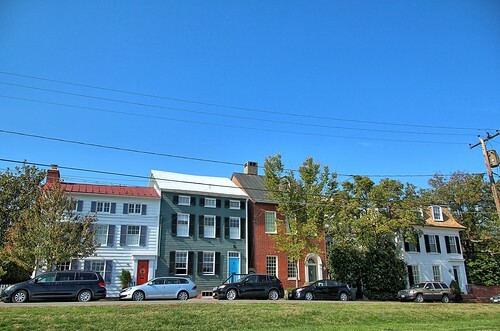 If you're not familiar with Old Town Alexandria, it's divided into four primary quadrants, Southeast, Northeast, Southwest, and Northwest. These four quadrants are based around the central intersection of King and Washington Streets, and each quadrant has its own unique and interesting elements that set it apart from the others. We'll be doing this series of blog posts on walking tours of Old Town with each post focusing on an individual quadrant. It's our hope that these guides will offer you a tour of Old Town from a local's vantage point. 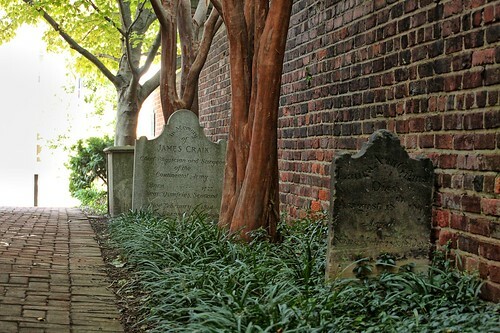 While I wouldn't really call it "off the beaten path," I think it's fair to consider these walking tours a deviation from the typical tourist guides offered online. So if you find yourself in Old Town, either because you live here or are visiting, we hope you can use our guide to glimpse something interesting and new. And if you're just reading from afar, we hope our photos and descriptions will help paint a picture of our amazing city. 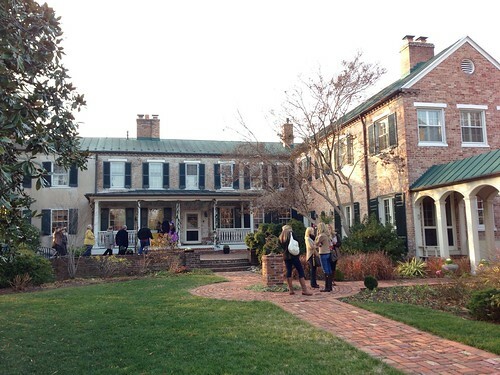 This first tour will focus on Old Town's Southeast Quadrant. This area is home to some of Old Town's oldest and most significant historic dwellings. This walking tour is 1.9 miles and should take between 40 minutes and an hour to complete. The terrain is easy and there are no hills or tricky footing. We'll start our walking tour on the Southeast corner of the Washington and King Street intersection, right in front of the Banana Republic. Facing east, walk towards the water along King Street for one block. 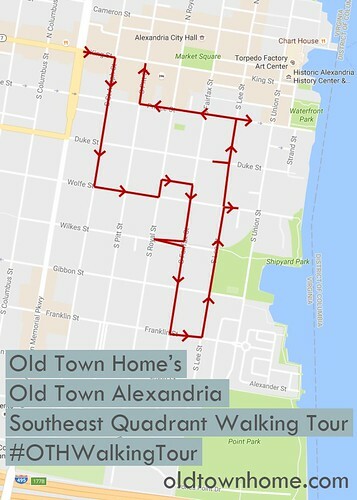 If you're going on this walk and take any photos along the way, be sure to share them in Instagram with #OTHWalkingTour. We'd love to see what you find interesting along the way. This block of King Street retains some of the old and historic buildings that still line this main thoroughfare. Though King Street is where you'll find the vast majority of people visiting Alexandria, we'll only be on King Street for a minute before deviating to the path less travelled. 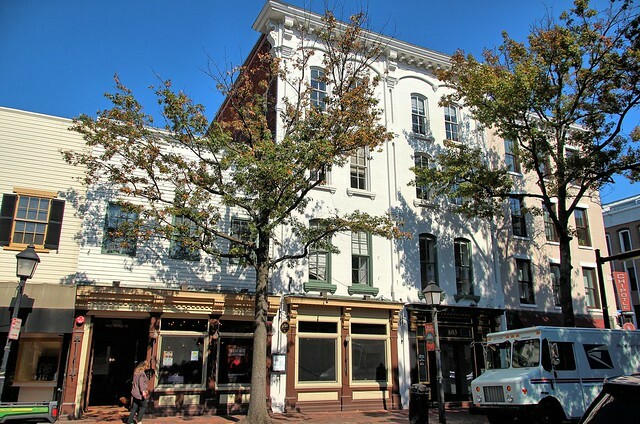 But while we're here, notice the shops and restaurants that now inhabit these historic buildings. Several blocks beyond this one have lost their old buildings a favor of modern development in the 1970s and 1980s, but King Street was once completely lined with these 18th and 19th century buildings. When we reach St. Asaph street, just one block from where we started, turn right and begin heading south. 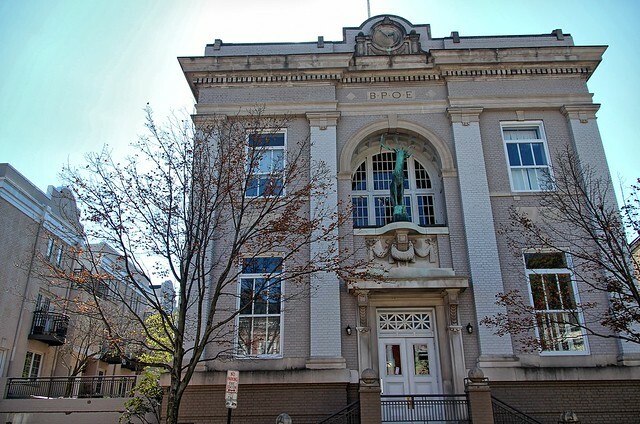 As you walk south in the 100 block you'll pass by several historic buildings, including a restaurant called Columbia Firehouse at 109 S. St. Asaph. 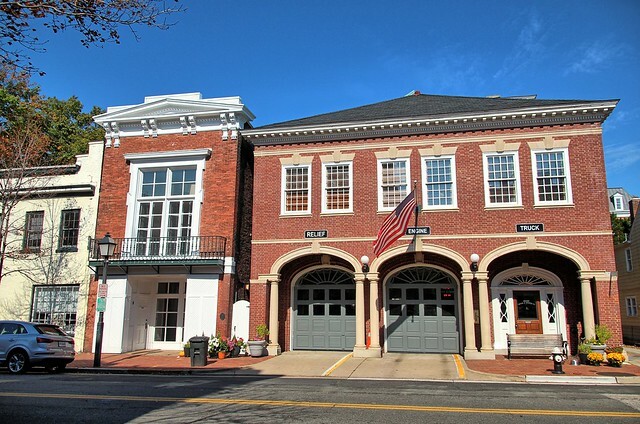 Aptly named, it was a 19th century firehouse that's been transformed into a good restaurant while retaining many of the historic elements of its life helping to fight fires. As you continue walking, note the other historic buildings on the right side of the street. These are largely occupied by local businesses with a few apartments nestled among the alleys. 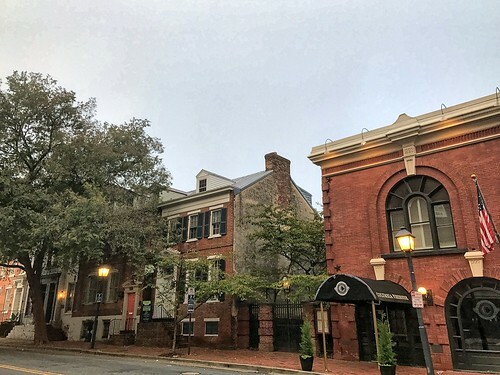 Businesses are common along King Street, Washington Street, and in the first blocks off of King, but beyond that first block, most houses you'll pass are private residences. A little further down on the left hand side of the street, at the end of the 100 block, you'll see one of Old Town's oldest dwellings, the Fawcett-Reeder House. While the front of the house faces Prince Street, you'll be able to gain a glimpse into the house's side yard over the fence. Personally, I think this is actually a much more interesting view of the house given the view of the many additions the house has seen. Continue walking South on S. St. Asaph street along the 200 block. The houses you see in this block represent some of the most grand and impressive in all of historic Old Town. 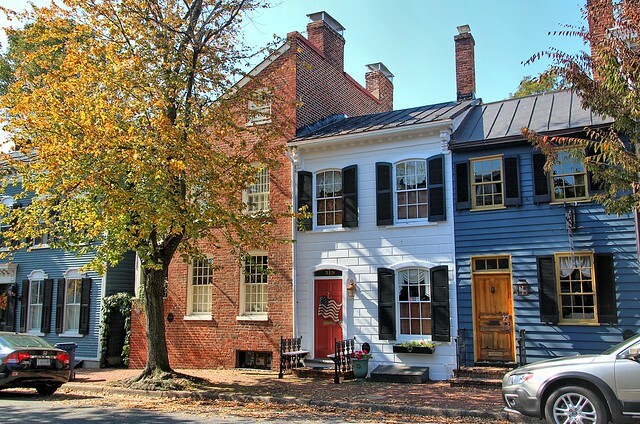 This collection of 18th and 19th century houses are both impressive individually and combined as eclectic mixture of styles and era. While we're looking at the exterior on this walk, as an Alexandria Realtor, Wendy has been fortunate to have seen many of these homes' interiors. What we've found is that some of the homes that look somewhat small from the outside are almost never particularly small on the inside. So these homes that look quite large from the outside, have extremely large interiors. 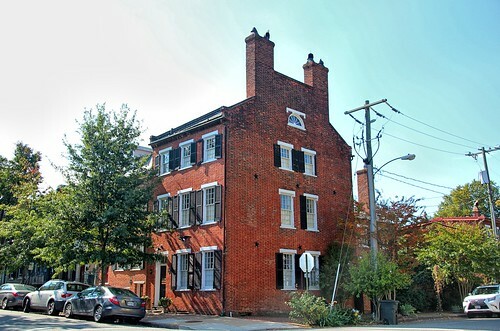 As you cross Duke Street take a moment to notice the house on the north west corner of the block. 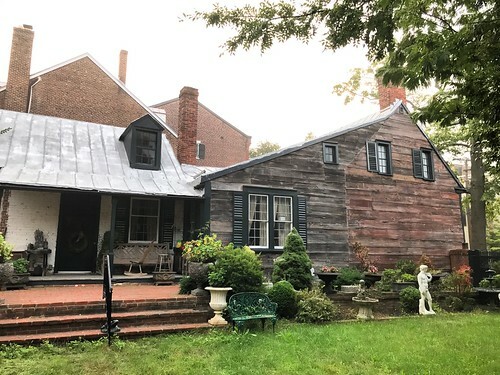 While all of the houses on each corner are amazing, this particular house, known as the Benjamin Dulaney House is well documented as one of the most significant and unaltered 18th century houses in the area and is on the National Register of Historic Places. 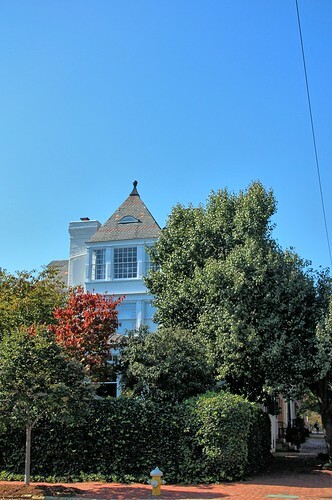 Continuing down the block you'll run into one of our absolute favorite houses at 311 S. St. Asaph Street. Not only does it look like it's straight out of a Scooby Doo script as the spooky mansion, but it is architecturally stunning, has several 200 year old family headstones in the backyard, sports a pool, and played a role in the Kevin Bacon 2000 movie, "Hollow Man". Next door to the Scooby Doo Mansion of our dreams is an historically significant house because of its style. If it looks peculiar to you it's because it's a flounder house. 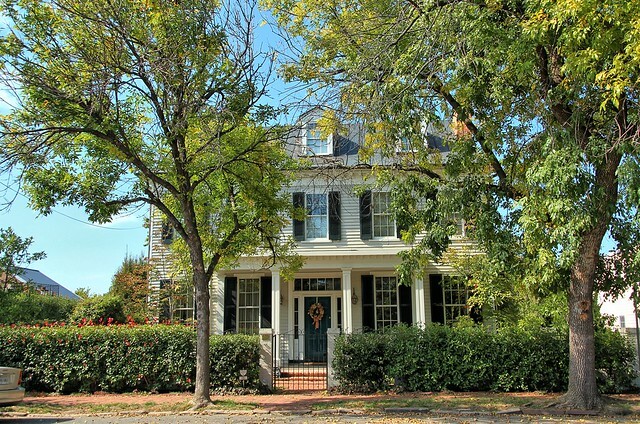 A flounder style house is a style of home that only has windows on one side and was often built as the first smaller dwelling on a lot before a larger, more stately home could be built later. This was often done to meet a requirement for land owners to build their purchased lot within the first two years of ownership. 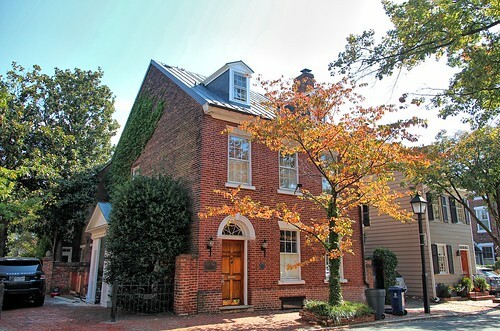 There are several examples of flounders around Old Town, but this one is significant as it is one of Old Town's few remaining free-standing flounders. This means that the original owners, for one reason or another, were never able to build the more stately home and stuck with the flounder alone. Once we reach Wolfe Street look to the right and you will see a true gem in Old Town, the Little Theater of Alexandria. 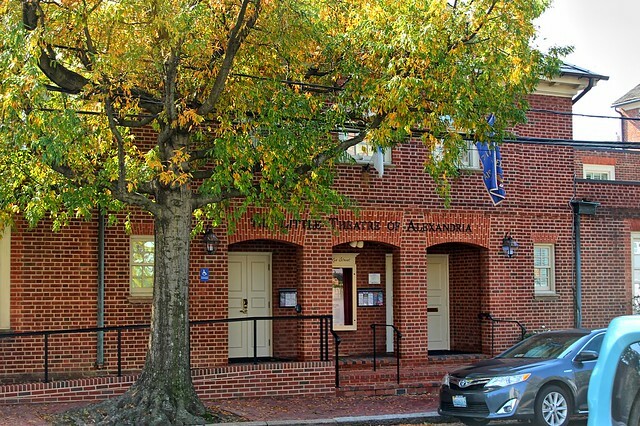 The LTA is a community theater and has an ever changing list of shows that are always worth checking out. If you're coming into town for a weekend and are looking for something fun, take a look at the list at the time of your visit to see if they have a show you'd like see. Turning left and heading east on Wolfe Street it will be near impossible to miss the largest home in Old Town Alexandria. This stately mansion, the Vowell-Smith House, was built in 1854 and is simply massive. We love to think about the parties we could throw if living here. When you reach Pitt Street turn left and begin walking up the east side of the street. As you near the center of the block between Pitt Street and Royal Street look to the left for Holland House at 415 Wolfe Street. You'll see a specially commissioned bronze sculpture of Thomas Jefferson reading on a bench. 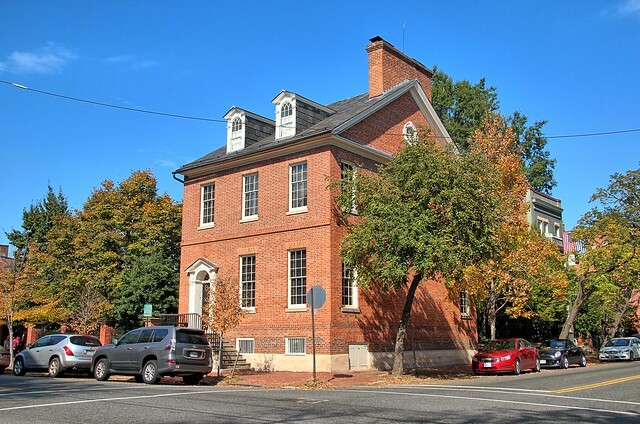 Until recently this property was considered the most intact in Alexandria, but it was recently subdivided and the construction of a new home on the corner of Royal and Wolfe began. The following photo was taken inside of the large walled garden of the house before the property was split. When you reach Royal Street cross to the east side of the street and turn left, headed north. As soon as you start walking keep your eyes to the right and look for the metal gate on the right just before you reach St. Mary's church. You'll be looking for an entrance that looks like this. 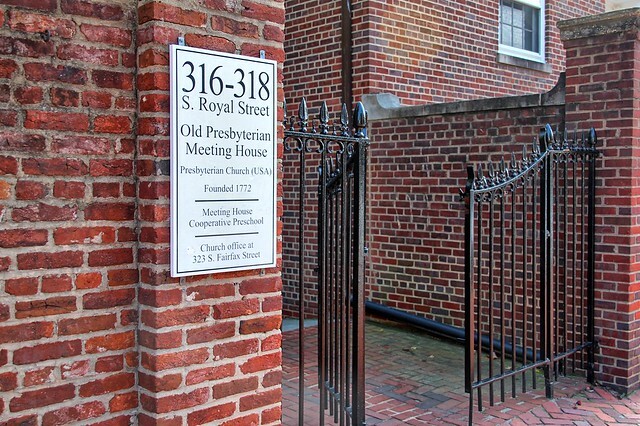 Turn right into these gates and you'll find yourself in the Old Presbyterian Meeting House's graveyard. In addition to the headstones, notice the large memorial on the left next to an American flag. That is the Tomb of the Unknown Revolutionary War Soldier. It's the only unknown soldier from United States conflict not buried in Arlington Cemetery. And as the story goes, when they were burying him his religion was unknown, but he was assumed to be either Presbyterian or Catholic. While he's buried in the Presbyterian graveyard, he's right up against the wall of St Mary's, the Catholic church. So if he happened to be Catholic, all he'd need to do to feel at home is to reach out and he'd be right where he belonged. Continue around the left side of the Presbyterian meeting house and to the front of the building on Fairfax Street. There you'll be able to read the plaques on the front of the structure explaining the significance of the building. 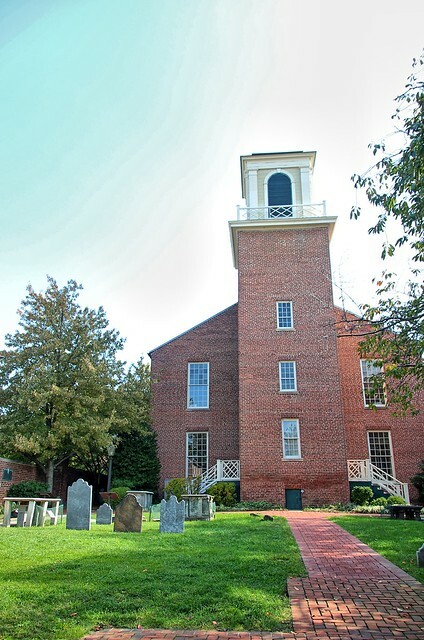 Most notably, when George Washington died in 1799, they were intending to take him to his family church, Christ Church, but it was snowing and that church was another eight blocks away, considered to be well outside of town. 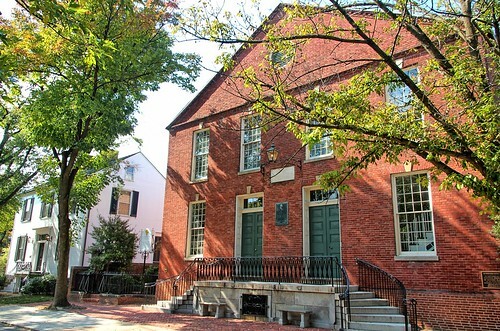 Therefore, Washington's eulogy was delivered here at the Presbyterian Meeting House. This is where Harry "Lighthorse" Lee delivered the famous quote of Washington, he was "First in War, First in Peace, and First in the Hearts of His Countrymen." Turning right onto S. Fairfax street and begin to head south. As you walk take in all of the historic homes along one of Old Town's quiet and very historic residential streets. 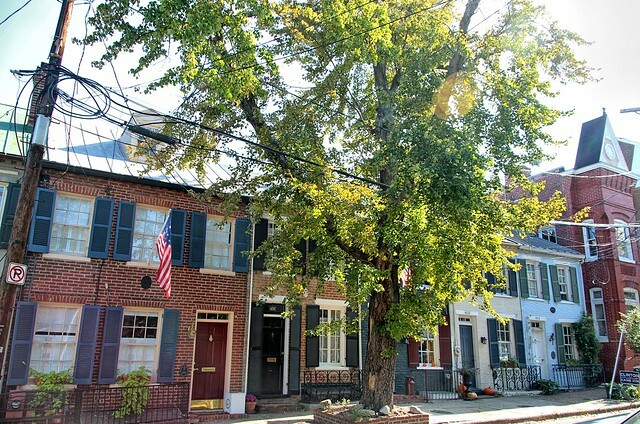 This street is a great example of how Old Town was built slowly over a long period of time. As a result you'll see pockets of 18th and 19th century homes of various styles all mixed together. As you continue south keep an eye out for Wilkes Street, where you'll turn right for a small detour. Here you'll see the Wilkes Street train tunnel, which was amazingly dug in 1851 after many of the houses on the street had already been built. This means that at one point in time the residents had to deal with their street turning into a rail line and tunnel before their very eyes! We did an Open Housing post on one of these houses several years ago. Today it's a great bike path that takes you down to the Potomac, to a sand volleyball court, and a great waterfront playground. Let's head east up Wilkes Street and back to Fairfax Street where we came from. 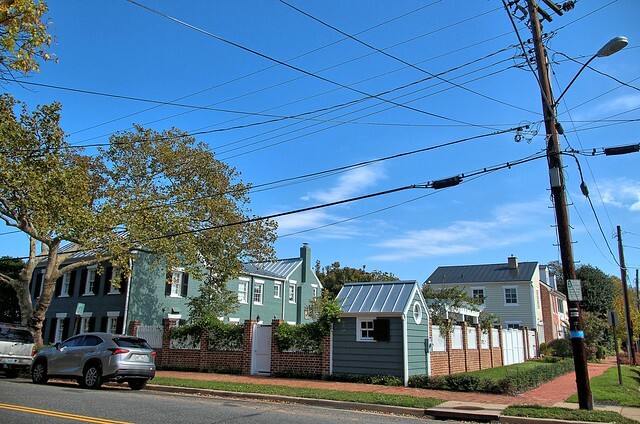 When you get back to Fairfax look diagonal across the street and you'll see one of the houses that's a more recent addition to the neighborhood. 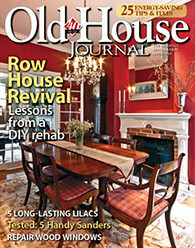 Though the old house fans may be able to tell these houses aren't 100 plus years old, you can see that the builders have done a good job embracing the style of the area for consistency and assimilation. In this part of town you can start to see more newer construction mixed with the old since it was less developed in the late 19th and early 20th century. 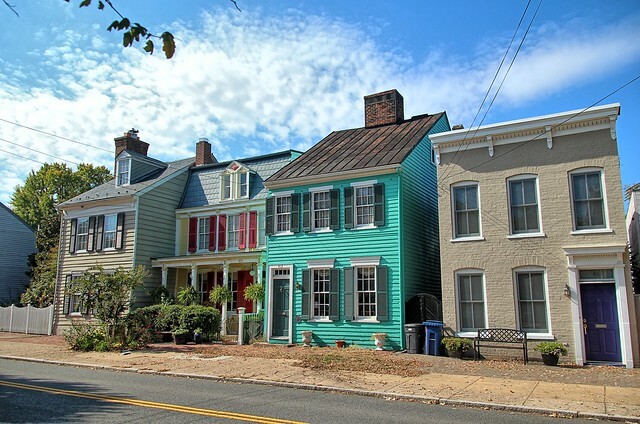 It wasn't until Alexandria's revival in the late 1900s that some of these houses filled in the gaps of land. Heading right and continuing south down South Fairfax Street you'll see more of the eclectic mix of Victorian and Federal style row houses. 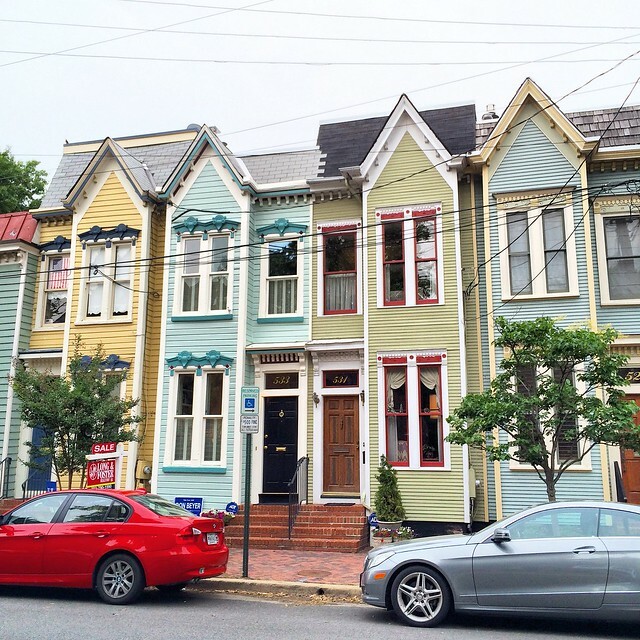 On the west side of the street look for the Four Painted Ladies of Old Town. They may not be part of an intro to a sitcom, but these narrow little Victorians are just as attractive. In the next block on the right side of the street you'll see one of the more unexpected houses in Old Town. 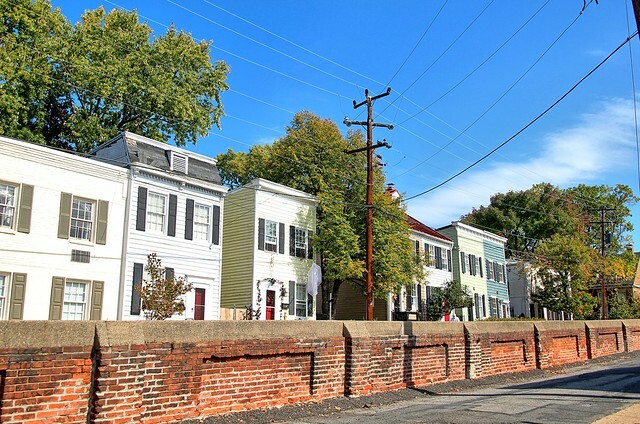 While row houses are the norm near the center of town, keep in mind that you're starting to get to the "outskirts" of town back in the mid 19th century. Here you'll see a large home built in 1830 and recently completely renovated to breathe historically accurate life into the previously tired home. A few years ago we watched the extensive renovation on this home and our mouths dropped open almost every time we passed. When you reach Franklin Street turn left and begin heading toward the river. Pay particular attention to the larger and beautifully manicured lot on the corner. Over the last few years this garden transformed from a dilapidated and closed laundromat and corner store into what you see today. During the transformation the owners had Alexandria Archeology set up several digs for artifacts. It was very interesting to pass by and see what they'd found listed on printouts on the fence. 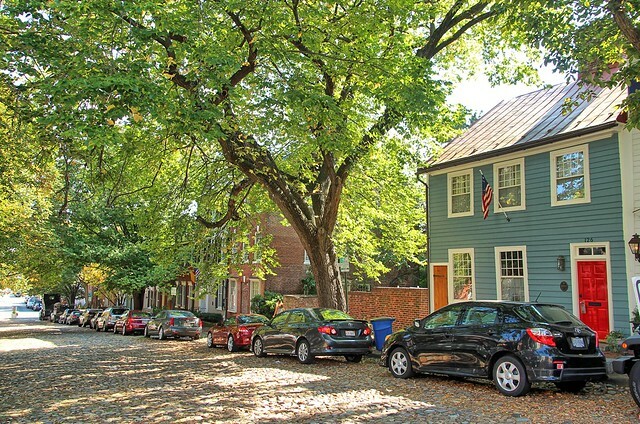 Once you're on Franklin take a moment to enjoy the quaint row of houses, ending in a carriage house. This small row of houses feels completely different than the rest of Old Town. It has always reminded us of something you might see in the UK rather than in Alexandria. When you reach South Lee Street turn left and begin heading north. Here you'll see one of our absolute favorite houses. 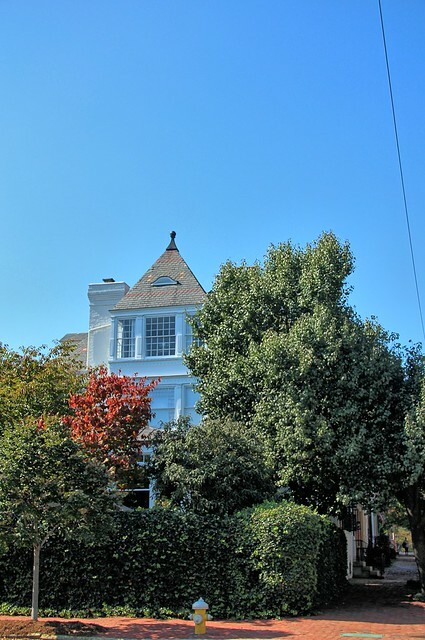 This beautiful home sits on a full 3/4 of an acre and takes up close to half of the city block. Behind their fence is a tennis court, pool, and the carriage house on the right in the photo above. 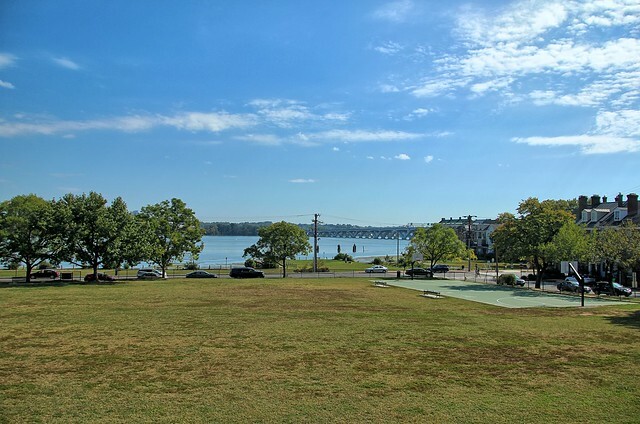 The best part of living in one of these homes is the view you're afforded overlooking the Windmill Park and the Potomac River. This is also a notable place in our lives as it's where I proposed to Wendy while on a horse drawn carriage ride back on May 2, 2001. If you're familiar with Old Town around that time, you'll likely know of the horse named Hobo in charge of the carriage that day. 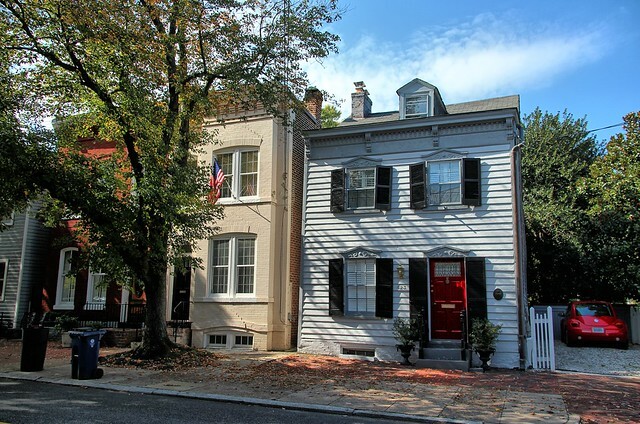 Continuing north on Lee Street take in all of the varying styles of houses along the street. 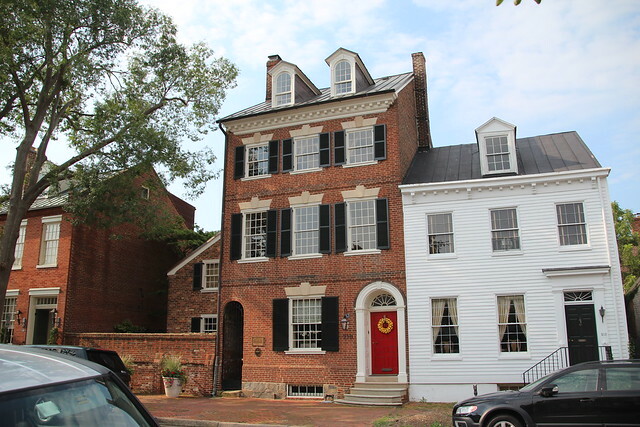 You'll see everything from small and narrow clapboard houses to grand 18th century Federal mansions. Some of my absolute favorite houses are the row of small colonial homes just before you reach Wolfe Street. I've been obsessed with these houses since we first saw them 16 years ago. We've been through several of them over the year and each is typically two rooms deep and three floors tall. More importantly, each must make effective use of the limited space available, but each is very livable. 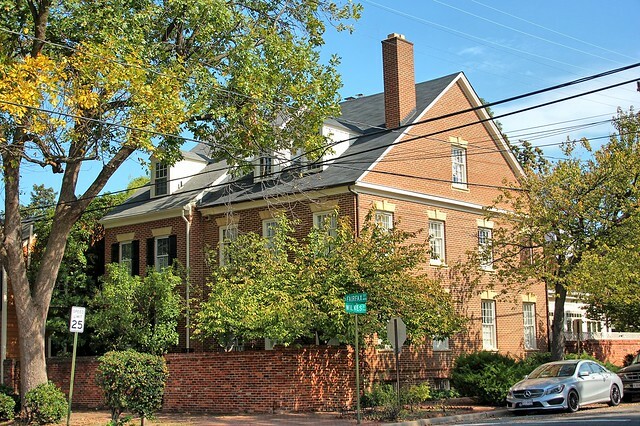 Just before you reach Wolfe Street take a look across the street at this beautiful Federal style home that is quintessentially "Old Town." 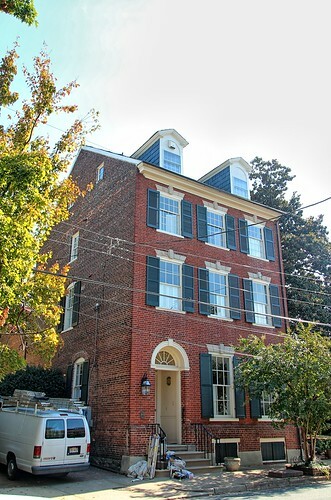 This home dates from the late 18th century and has likely looked almost as it does today since it was originally built. 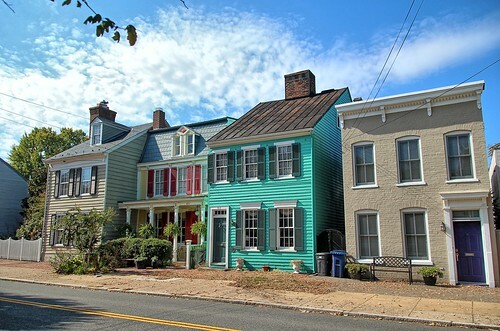 Take a quick detour right down Wolfe Street to take a look at some of the quaint homes on either side of the street. 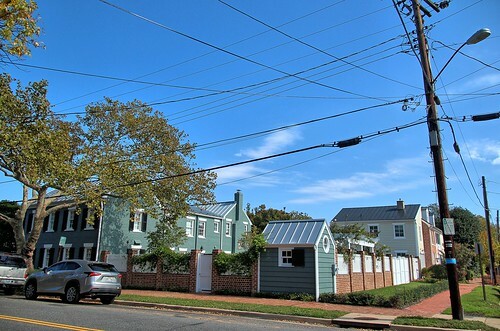 Legend has it that most of these small homes belonged to sailors that worked from the seaports that made Alexandria famous. Turn back to Lee Street and take a right to continue walking north. 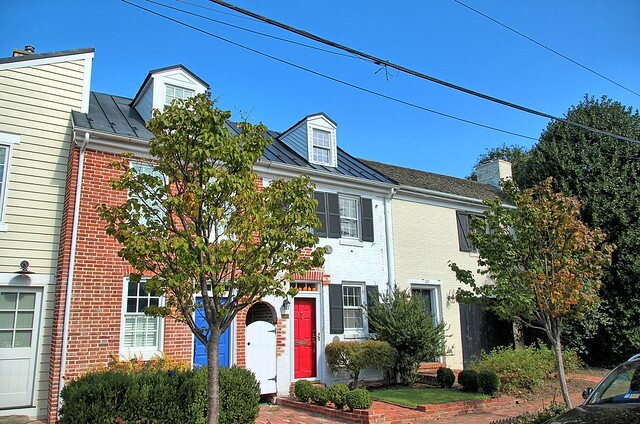 Pay particular attention to the following collection of homes on the west side of South Lee Street. The brick flounder on the left is the infamous home of the Lee Street Rats. If you want to see what the rats are up to today just glance down at the small black basement window at ground level. Also note the white house next door to the flounder. While it looks like a stone house, it's actually a wood sided house made to look like stone. Wendy and I refer to this house as "the mini Mount Vernon" since it's the same siding treatment that was done on a much larger scale for Mt. Vernon. If you look closely the faux stone is beveled at the edges and the white paint has sand added to make it appear textured like stone. As we approach Duke Street we'll take a quick left to walk half way up the block. 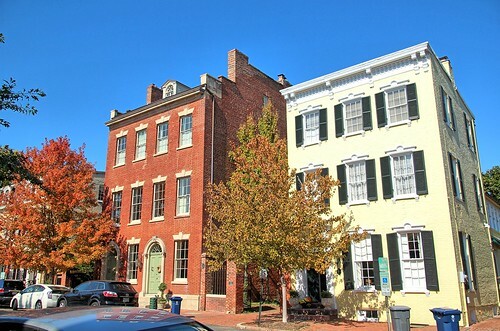 Pay attention to the four story grand Federal home on the left. This imposing structure is the home and physician's office of Dr. James Craik (who I mentioned earlier). If you'll noticed the small arched doorway on the left side of the main part of the house, that's what's known as a "Horse Pass." It's essentially a cut through to allow the owners of the house to walk their horses back to the stables behind the house without having to take a long trip around the house. Many other houses in Alexandria have these cut throughs. Though not all houses had horses or stables, these little alleys are often generically referred to as horse passes in all cases. Head back to South Lee Street and turn left to begin heading north again. 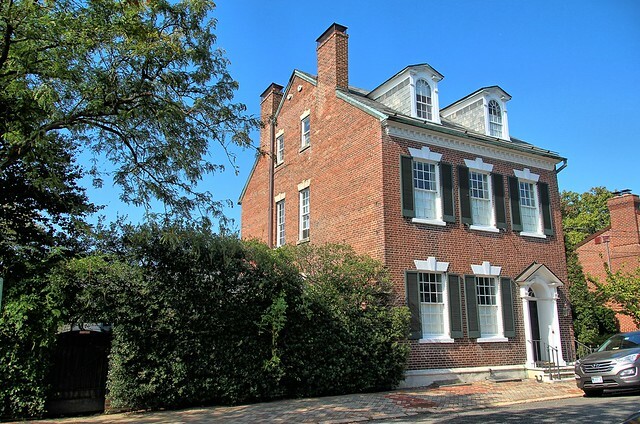 Take a moment to find the Johnston-Vowell house on the east side of the street at 224 South Lee Street. 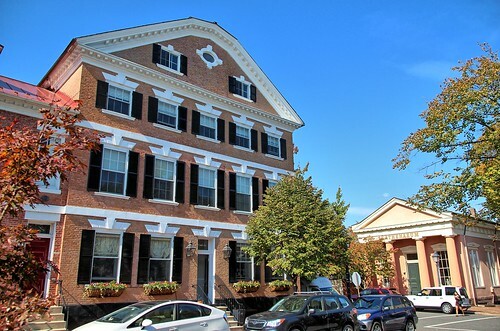 It was built in 1757 by George Johnston of Stamp Act fame. As you approach Prince Street take note of the very large house on the corner of South Lee and Prince. 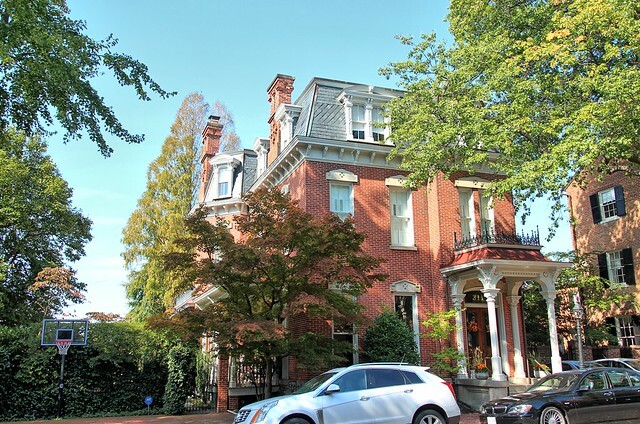 This home was divided into two homes many years ago, but recently the owner of one side purchased the other half of the house and undertook a large renovation to rejoin the home as one impressive residence. 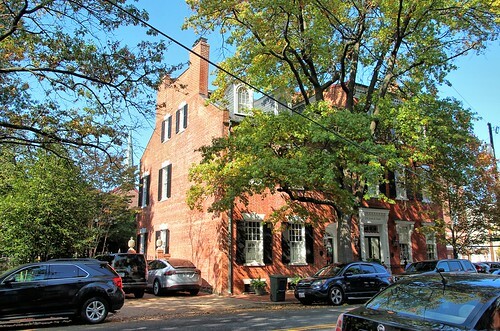 In the background across the street you can see the Athenaeum, home to the Northern Virginia Fine Arts Association. 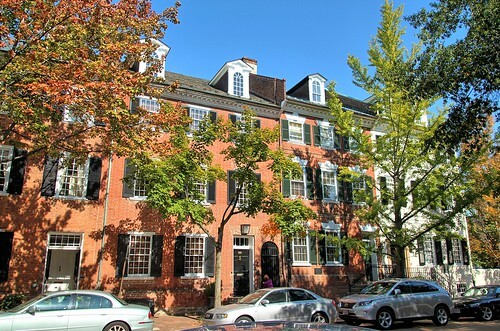 When you reach Prince Street take a look to the right and look over the cobblestone street of Captain's Row. The cobblestones are one of two streets in Alexandria which are still covered in cobblestones, and is an example of how most of Alexandria likely looked in the early 1800s. 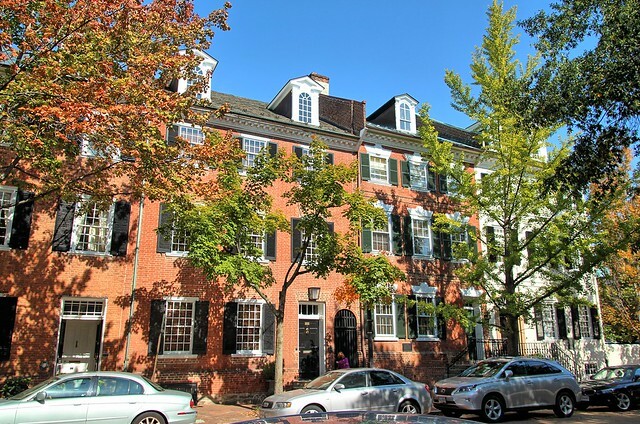 Though most assume the name Captain's Row means that many sea captains lived on this block, it is actually a reference to Captain John Harper. Harper owned many of the lots on this street and would build homes for his children so they could all live on the same block. Turning west begin walking up Prince Street and away from the water. 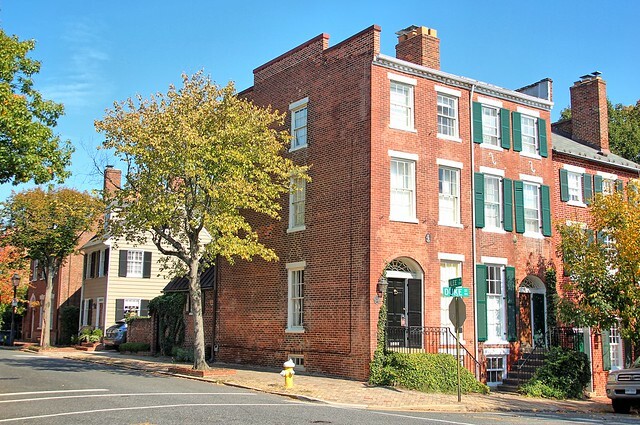 Here you'll see many of the homes that once belonged to Alexandria's most prominent families, business people, and citizens. 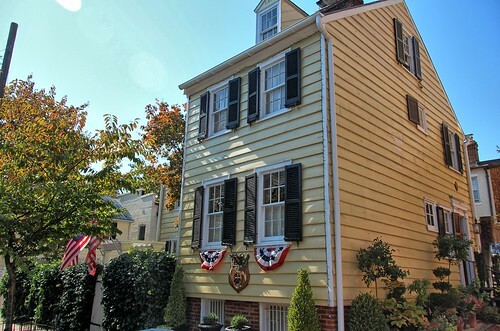 Many friends of George Washington lived in this several block stretch of houses, and at the time of Washington's passing, many mourned his death by painting their fireplace mantels black. In at least one of these houses that black paint still remains. 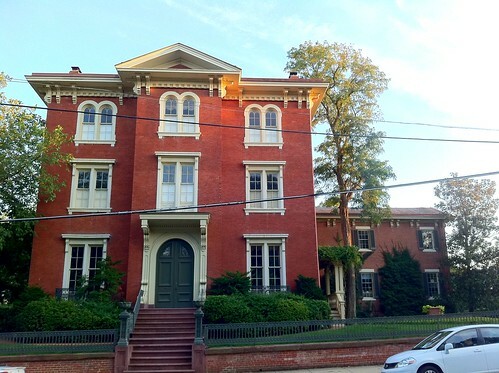 In the next block you'll see both an historic firehouse turned residence and one of Alexandria's active fire houses. Given the close proximity of the houses in Old Town, these old fire houses with their crew of men at the ready to knock down flames with their pump trucks was imperative to the safety of the town residents. Today you can take a glimpse into the past by looking in the left bay of the active firehouse. There you'll be able to see one of the antique pump engines that would have been in use next door during the heyday of that building's fire fighting days. Across the street from the firehouse is an old Elks Club building that's been more recently converted to luxury condos. The building does retain the large elk statue watching over the entrance of the structure. As you continue up the street notice the extremely large house on the right side of the street at 415 Prince Street. 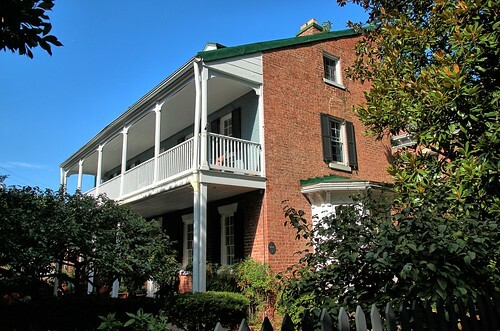 The house, known as the Bank of the Potomac has two large arched front doors. Throughout the years this home has worn many hats and was active as a residence, apartments, bank, wartime government building, and a statehouse. My favorite story about the two front doors was when the building acted as the statehouse for the newly formed West Virginia. Supposedly the governor of West Virginia stated that the left or western door was reserved strictly for West Virginians, the other door was for everyone else. As you approach Pitt Street glance further up the street at the amazing set of windows overlooking Prince Street. The house is practically hidden by trees but the entire place is spectacular. When you reach Pitt Street turn right and head back towards King Street. 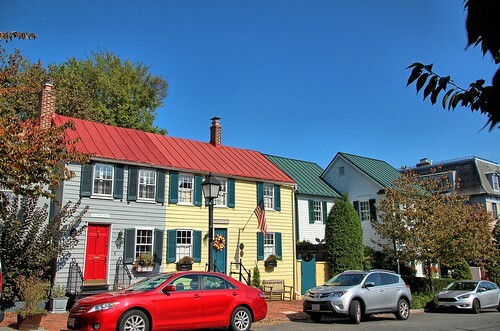 Take a moment to notice the small yellow house on the left side of the street. This home is one of Washington's Tenement Houses and the newest owners of the home have lovingly restored the home since purchasing it a few years ago. Stop by the plaque on the front of the house to read more about its history. 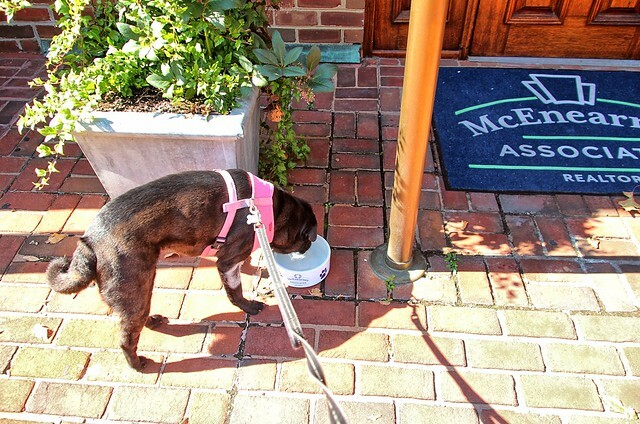 If you're like us and have a dog in tow during your journey, now's a good chance to let them stop for a drink on Old Town's very pooch friendly sidewalks. Lulu likes to stop at the McEnearney office door for a little refresh. She knows this is Wendy's office and just might see someone she knows coming and going, ready to shower her with attention. As you make your way back to King Street you can either head back to the left and where you started your walk, or head to the right to enjoy the fountain at Market Square about a block away from the Pitt and King Street intersection. We hope you've enjoyed our guided tour of our lovely city. We've tried to touch on the true highlights of the Southeast Quadrant, though it would be near impossible to hit everything without making you walk six or more miles. It's also worth considering that each of the homes you pass along the way likely have a rich and storied past in one way or another. 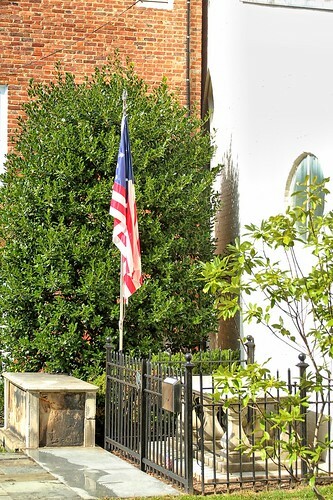 The points of interest that we recognized along the way only scratch the surface of what 250 years of history can bring to a town. I mean, we didn't even make it along the waterfront during our walk, and that will be changing tremendously over the next few years. 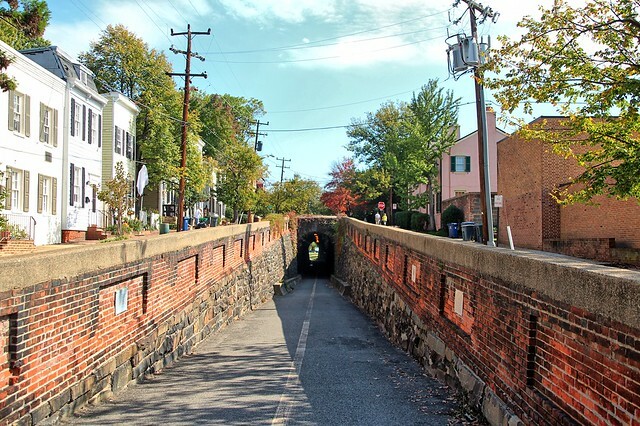 Keep your eyes peeled for more Alexandria walking paths that we'll do in the future. We plan to do one for each of Old Town's quadrants before we're done. 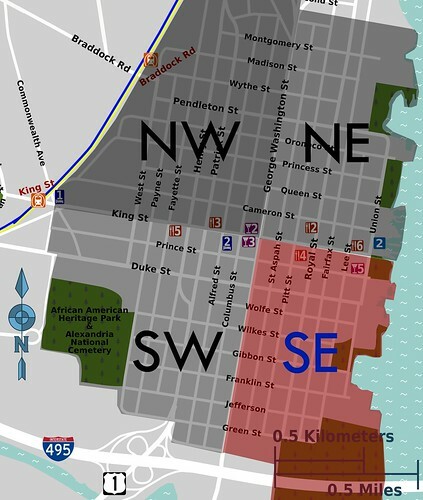 And if there's anything you feel we've omitted from Old Town's southeast quadrant, please let us know in the comments. This was a really delightful post and I look forward to dragging my boyfriend on this walking tour! Oh my, I have to do this walk. I love walking up and down the streets of OT. Haven't been in the south side for awhile, but now I will and maybe head down to the park. Wonderful post and so very much appreciated!!! Thank you! 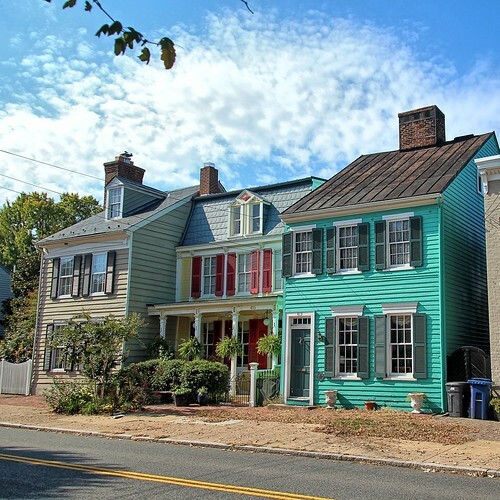 I grew up on Lee street and have spent time in almost every house you mentioned. One story I always remember about the tunnel is how the women would pour boiling water on the soldiers as they walked thru the tunnel. Welcome to Alexandria! Thank you very much for taking the time to put this together. Fantastic information! My wife and daughter and I were just back to Old Town this past week (we live in Atlanta). I was born in Old Town 58 years ago in the building now on the corner of Duke and Washington and lived as a child nearby. Always great to "come home."